Chokdrup Ling was established as a retreat center in 1998 by Lama Padma Yontan Gyatso, the resident teacher of Chagdud Gonpa Amrita in Seattle, Washington. His Eminence, the late Chagdud Tulku Rinpoche honored this beautiful 240-acre retreat property in the Four Corners Region of Southwest Colorado by naming it Chokdrup Ling, meaning “Land of Supreme Accomplishment”. Lama Padma has always felt that Rinpoche didn’t choose this as a mere name for the land, but as prophecy of what will occur there in the future. 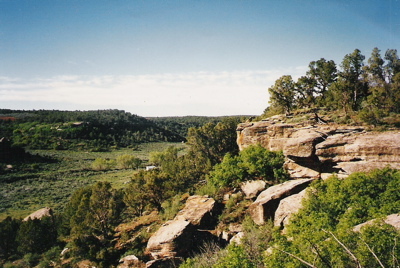 The property is bordered by Canyons of the Ancients National Monument, famous for its extensive archaeological sites unique to the Ancestral Puebloan and other indigenous cultures who have revered the land for centuries. Endowed with sandstone canyons and forested highlands, it is a spacious land blessed with silence and solitude, and yet it is accessible from major urban areas. Currently, there are three retreat cabins that have been used over the years by Lama Padma, his wife Susan, other practitioners, and visitors. All serious Buddhist practitioners aspire at some point in their lives to be able to take advantage of an opportunity to deepen their practice. The special qualities of Chokdrup Ling are conducive to a natural peacefulness, making it the ideal place to accomplish authentic Dharma.